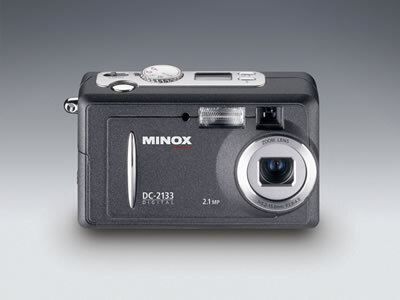 MINOX amplifies its range of digital cameras by a further model: the high-performance and super-compact MINOX DC 2133. The new digital camera, equipped with a 3 x optical zoom, makes, thanks to its versatile applications, every picture to an unforgettable memory. As her digital antecessors, also this camera is extremely user friendly. Even without previous knowledge, the photo amateur can join the world of digital photography easily and fast. The MINOX DC 2133 consists of a CCD-image sensor with 2.1 million pixel as well as high quality MINOCTAR lens with multi-coating. The 3x optical zoom lens has an auto-focus and offers the photographer a wide scope of creativity. The results are high quality snaps with a natural color reproduction and high dynamic. Even in difficult light conditions the automatic light balance provides the ideal speed to ensure that the user always gets excellent pictures. A simple menu guidance plus the clear and precise symbols enable the user to change quickly between shooting the picture, reproduction and the storage function. An instant judgement of the picture both during and after the shot is provided by the 1,6“ monitor. The internal 8 MB memory and an external up to 128 MB SD memory card grant a high flexibility. For the easy transmission between camera and computer the MINOX DC 2133 has a USB interface. Using the software, which comes with the camera, the pictures can be directly processed on the PC and passed on. Compact dimensions make this lightweight (only 170 g) the ideal companion for every occasion. The modern housing, coated with a high quality and handy soft-touch laqueur emphasizes the excellent design of that camera. The scope of delivery includes a DC-ROM, 2 round cell batteries, a ever-ready case , wrist strap, USB-cable and a user manual.